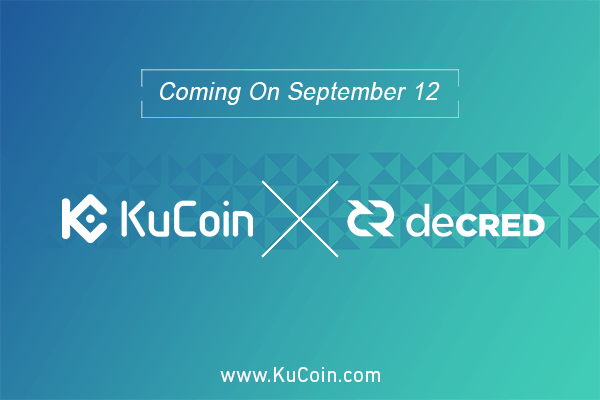 As part of the revolutionary growth of KuCoin, it has listed one more capable project that will interest many significant partners, traders or investors. The newly listed token is the autonomous digital currency of Decred. Deposit and trade transactions can now be transacted using crypto pairs like DCR/ETH and DCR/BTC. Users can now execute trades by using KuCoin Apps or direct website at www.kucoin.com. It is a kind of digital currency that is autonomous. It is a self-ruling currency. Here, stakeholder is the one to create governing rules. Two years ago (2016), Decred was striving to deal with blockchain governance. Its groundbreaking consensus voting system enables stakeholder and makes way for a smooth or seamless transition from a single set of rules to a different one. The decentralized ways of funding itself and making decisions have empowered individuals to establish a solid, growing digital currency and free from any third party influences. It was developed from pure verified open-source technology. An innovative hybrid of consensus voting system, PoS and PoW are all highlighted on this. It contains smart contracts including Lightning Network which all work on the growth of the system. Another attribute is presented as a public proposal platform which is empowered through blockchain. Moreover, it is a censor-resistant. A cross-chain atomic swap on different cryptocurrencies is observed here too. Different principles that guide the project binds Decred. These were produced to form a reasonable and maintainable structure inside. It will help it to achieve the primary objective- to become a decentralized and autonomous digital currency wherein every stakeholder has a real voice. It has an open source and free software. Any software that is developed as part of the system should be free at all. DCR is the cryptocurrency symbol for Decred’s coin. Twenty-one million is its maximum DCR supply. At this moment, more than 8 million is circulating on the crypto market. The hybridization produces a balance among stakeholders and miners. It encourages any kinds of good supports to secure the network. Not all coins are mined. Therefore, opportunities still await new miners.